Today we celebrate St. Audrey's Day, namesake of the word tawdry and the Tawdry Knickers project. Wear your cheapest lace and do your best to practice abstinence in her honor. Our modern usage of the word tawdry comes from a slurring of the name of St. Audrey, a young woman who regretted wearing pretty things but not maintaining her virginity. Some virgins hold up better than others over the course of history. Poor Aethelthryth was an Anglo-Saxon princess born around AD 640 to the King of East Anglia, the area around Suffolk, England. Her name, and her reputation, certainly took a beating during the Norman years that followed as her name was changed first to Etheldreda and then further to Audrey. Audrey was a sweet kid who loved to wear gold chains and necklaces. As was expected of her, she married, only to be widowed three years later. The Anglo-Saxon scuttlebutt at the time was that she had taken a perpetual vow of virginity and that her first marriage was never consummated. Poor Audrey became a nun for a time but eventually married again, dutifully bowing to political and familial pressures. Her new young husband did not share her piety and continually tried to pick the locks of the royal chastity belt. He even went so far as to try to bribe their local bishop, St. Wilfrid of York, to free his wife from her virginal commitment. But the bishop appreciated her moxie and helped Audrey flee south to Ely, in the English county of Cambridgeshire, with her husband close on her heels. 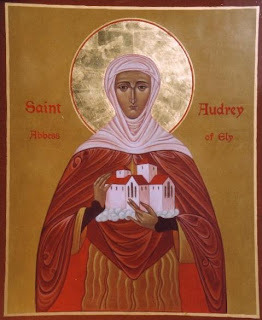 Ecclesiastical legend has it that God himself rescued Audrey from an amorous fate by raising the tide for seven days around the promontory she had climbed to escape her mate. This cold shower finally sent her husband into the arms of someone more accommodating and freed up Audrey to dedicate herself completely to the church, becoming the abbess of Ely. She finally died at around forty years old with a bulging tumor on her neck, which she believed God had inflicted upon her for the necklaces she wore in her younger days. Audrey was eventually canonized and became the patron saint of Cambridge University, neck and throat ailments, and widows. In the years following her sainthood, the Isle of Ely would hold an annual fair every June 23—the feast day of St. Audrey—at which merchants would sell gold necklaces and, particularly, lace scarves called “St. Audrey’s lace.” Over time, these fineries became cheap trinkets hawked to the county wenches as “S’nt-Audrey lace” and, finally, tawdry lace. By the eighteenth century, the word tawdry had come to represent anything gaudy, cheap, or tasteless—a poor legacy for yet another innocent virgin of history.